Maryland county executives are encouraging Gov. Larry Hogan to support construction of Metro's Purple Line. 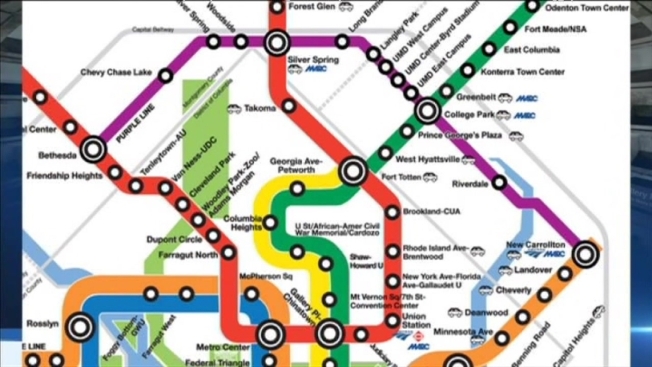 The proposed 16-mile line would connect Montgomery and Prince George's counties with 21 stops, running east-west from Bethesda to New Carrollton. Gov. Hogan outlined plans to increase funding for highways and roads in his State of the State address Wednesday but did not mention the future of the Purple Line. Two weeks ago, Hogan said his budget would include funding for the project. Prince George's County Executive Rushern Baker said building the Purple Line is essential for accomodating a growing population in Montgomery and Prince George's counties. "We're going to grow as a state in those particular regions, and we're going to grow and attract businesses to those areas; and the only way that happens is to invest in the Purple Line that we've already put money into," he said. Montgomery County Executive Isiah Leggett spoke in support of the Purple Line before a room of business executives at the University of Maryland Wednesday. He said the future of the state depends on the Purple Line's approval. The business community needs "to convey that message to the governor," he said. Tom Aylward, a property developer with Jackson Shaw Real Estate and Development, is counting on the Purple Line to improve transportation options for residents of the company's Brick Yard project in Beltsville. He said he's optimistic about what Gov. Hogan will do. "I think he gets it," he said. "Gov. Hogan is in real estate; he understands the value of the transit network."